The 4 PI SKY team has been granted time on the European VLBI Network (EVN) to use a new mode to rapidly hunt transient events (PI Rushton). From 2015 we will use Automated triggers to override e-VLBI sessions if we detect outbursts from objects like flare stars and Gamma-ray bursts (GRBs). The system will quickly generate new scheduling programs for each participating EVN antenna and we aim to robotically slew the whole array to the event after few 10’s of minutes. Radio emission from transients can start to rise after just a few minutes of being detected at high-energy. It is important to rapidly slew to the source and begin monitoring at high-resolution in order to localise the emission. We will also be able to search for outflows and proper motion caused by jets of plasma. This will give us unique insight to the causes of the most energetic events in our Galaxy and the wider Universe. Our network currently uses VOevent alerts from NASA’s Swift space-based telescope to robotically trigger the Arcminute Microkelvin Imager large array (AMI-LA) in Cambridge, UK. 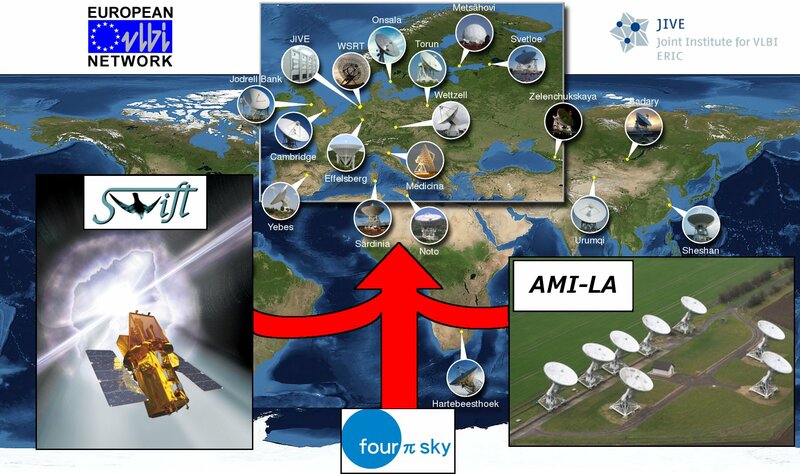 The AMI-LA telescope in rapid response mode (ALARRM) can respond to a new outburst of gamma-rays after a few minutes and will help trigger observations at high-resolution with the EVN. Developing automatic generic triggers for the EVN has been a joint effort including JIVE, Onsala Space Observatory, EVN TOG CBD and PC. In particular we thank the efforts of Simon Casey, Mark Kettenis and Zsolt Paragi. The project includes team members from University Oxford, Instituto de Astrofísica de Andalucía, Space Telescope Science Institute and Caltech.